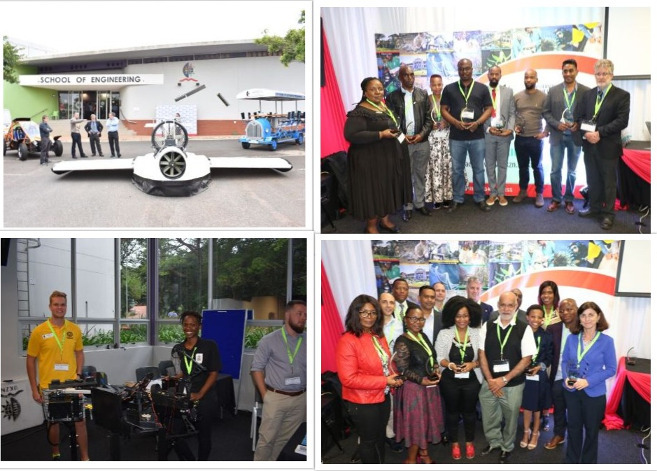 UKZN’s School of Engineering recently hosted their Research Exposition and its Annual Industrial Awards function at the UNITE building at the Howard College campus. Students and staff at the School of Engineering pulled out all the stops to present their research work at the event. Visitors were treated to a collection of research projects put together by the Mechanical Engineering staff and students. Vehicles on display include the Flying hover craft, Electric trike, Off road rally vehicle and the Technology pedal bus. External stakeholders included officials from Transnet, Eskom, Dube TradePort, SASOL, eThekwini Municipality and Armscor. They were amazed with the Research and Innovation coming out of the School of Engineering. There will be over 30 projects across the five Disciplines (Chemical Engineering, Electrical, Electronic and Computer Engineering, Civil Engineering, Mechanical Engineering and Agricultural Engineering) on display. The Environmental Fluid Mechanics Lab driven by Professor Derek Stretch, Dr Katrin Tirok and Dr Justin Pringle showcased their research towards developing a prototype that generates biofuel in a completely carbon neutral and environmentally safe manner. The research idea emanated from NASA’s Jonathan Trent, who proposed that growing algae in long flexible tubes placed in the ocean can be harvested for biofuel. The team are able to convert raw sewage that are discharged in the ocean into fuel. Professor Tilahun Seyoum team showcased their research in the improved methods of transportation, pre-storage and storage treatments on the quality of fresh tomatoes in the South African Supply Chain. The outcomes of the project will provide information for both large-scale and emerging farmers. It was also found that this model can be used to be adapted to other fruit and vegetables supply chains. Another interesting research driven by Seyoum showcased the effective performance of cowpea under moisture irrigation (low-pressure irrigation technology) which saves between 10 – 40% of water than conventional irrigation. Professor Graham Jewitt’s team from the Centre for Water Resources Research (CWRR) presented their research which focuses on identifying ways to protect the ecological infrastructures which improve water security. The research focuses on the uMngeni, the Mthinzima, the Baynespruit, Mzinyathi, and the Palmiet catchment areas. The Power Systems Research Group driven by Professor Akshay Saha presented their research on electrical, load flow, implementation of protection, automation, control and SCADA system. The research will immensely benefit the Port of Durban that has been implementing development on the existing electrical power network. Professor Bruce Sithole’s team presented their research into the development of technologies which enable the extraction of maximum value from bio-resources and minimises waste that goes to landfills. Waste such as sawdust, chicken feathers becomes a valuable resource by extraction of high value materials. The Pollution Research Group (PRG) presented their sanitation research that impacts people globally. Their research involves: Finding effective and sustainable ways of dealing with the contents of current non-sewered sanitation options; and developing safer healthier sanitation technologies. The Research Expo was followed by the Industry Awards Event. At this annual event, the School of Engineering took the opportunity to acknowledge the 30 industry and government institutions that have supported UKZN students through bursaries and staff through research output. The institutions contributed to the research, innovation and growth of engineering for the country. The companies include South African Nuclear Energy Corporation, Construction Education and Training Authority, Council for Scientific and Industrial Research, KZN Department of Rural Development and Land Reform, Eskom, eThekwini Municipality, National Research Foundation, South African Sugar Association, SASOL, Sugar Milling Research Institute, Study Trust, Telkom, Transnet Umgeni Water and Water Research Commission, Albert Wessel Trust, Agricultural Research Council (ARC), Department of Agriculture, Forestry and Fisheries, Durban Solid Waste, Engen, KZN Department of Transport, South African Clothing and Textile Workers’ Union, South African National Roads Agency, South African Pulp and Paper Industries, SAPREF, South32, Hulamin, Industrial Development Corporation, Altron and Arcelormittal. ‘The successes of the projects would not have been possible without support from our industry partners. The investment in the School of Engineering through bursaries, research and equipment has made an immense contribution to knowledge generation. It has elevated UKZN Engineering’s scientific visibility to a global standing. The School of Engineering humbly acknowledges the support from our industrial partners and would like to express our gratitude and appreciation,’ said Bright. Mr Collin Moopanar, Transnet Executive Manager for mechanical research, said: ‘I would like to convey our sincere thanks to the School of Engineering for a very well organised and co-ordinated awards event. We were impressed by the research projects on display at the exposition. We are proud to be supporting the student’s initiatives at UKZN’.